Bus from KL to Kangar is the most convenient way to visit Perlis state capital city. Kangar has no train station. The closest train station is at Arau which is 10 km away to the west of Kangar. Hence, train is not a direct service to Kangar which requires passengers to take shuttle service from Arau to Kangar. Etika, Intercity and Transnasional are larger players serving bus from KL to Kangar. 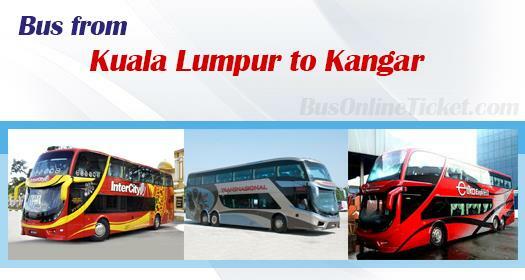 They supply frequent bus services to Kangar throughout the day. Konsortium, Mayang Sari, and Plusliner are relatively smaller players in this service route because they only provide few departures to Kangar daily. Etika deploys mainly single deck coach to run service, whereas Intercity deploys high deck coach to service passengers. Regardless the coach types, all coaches are equipped with advance comfort features like air conditioning and reclining seats to ensure passengers having a comfortable journey from KL to Kangar. Duration for bus from KL to Kangar usually takes about 6-7 hours, depending on traffic condition. Coaches depart from Terminal Bersepadu Selatan (TBS) and with some coaches have second stop in KL Hentian Duta Station to pick up more passengers. Please note that Hentian Duta Station is a bus terminal located at northern Kuala Lumpur. Bus from KL to Kangar will usually provide 1 stopover for toilet break along the journey. In Perlis, most coaches stop at both Kangar intercity bus terminal and Kuala Perlis Bus Station for passengers drop off. The first stop is at Kangar intercity bus terminal and the last destination is at Kuala Perlis Bus Station. For passengers taking bus from KL to Kangar sevice, please alight at Kangar intercity bus terminal. The bus fare for bus from KL to Kangar is ranging from RM 47.00 to RM 50.00, depending on the coach selection. The journey for bus from KL to Kangar is popular with its magnificent rice field view in northern region of Malaysia. Now it is even more convenient by booking bus ticket online with BusOnlineTicket.com. You just need to go online to do online booking and payment in BusOnlineTicket.com to get instant confirmation booking.